An Oahu submarine tour may take you deeper than you might think. Did you realize that you could board a real, full-sized actual submarine off the coast of Oahu, and then descend 100' or so to the ocean floor. Submarines you've seen in the movies or on TV don't have any windows, but these submarines have large port windows at every seat so you won't miss a moment of the undersea adventure you are about to experience. You'll be underwater for about 40 minutes and at that depth you'll likely be staying down longer than any scuba divers taking a tour from one of the local dive shops. What happens on your Honolulu submarine tour? Your underwater Honolulu submarine tour will begin as you're picked-up at your Waikiki hotel. You will then be delivered to the harbor where you board the special Atlantis shuttle boat which takes you out to the actual submarine itself about a mile off shore which is already poised over its dive site in the channel. After transferring to the submarine your descent will begin. As the submarine makes its initial submersion into the blue Pacific you will be delighted as you get your first glimpse of the underwater world. If you would prefer to see through the clear waters off Waikiki from a glass bottom boat that remains on the surface, this is available to you as well. This is a good choice if you have small children because although the Oahu submarine tour allows small children to come, they need to be a minimum of 3' tall and the there is no minimum on a glass bottom boat tour. So when was the last time you were on a submarine? Probably not too many places in the world you can do a submarine, but you're lucky if you're going to Oahu and we actually have a couple of them there. These are real bonified submarines. I mean, these are not glass-bottomed boats. You get into the submarine and you actually descend. You get down to about maybe 100 feet or so and you're down for maybe about 45 minutes, so it is a real amazing experience. These craft that they have are multi, multi million dollar vessels that are well maintained, are excellent for what they do. These will be the largest submarines that are designed for the purpose of sightseeing if you will, that you will find anywhere on the planet. Here you can see a submarine and you can see in the distance, you can see Waikiki right off the coast. The way this works, is that you'll be meeting in Waikiki at a special location. You can actually drive over there, or you can be picked up from your hotel, and that's all included in the pricing. They'll pick you up. They'll bring you to the location where you sign up and kind of organize yourself for the tour. Then, they're going to take you in a vessel that's going to take you out to where the sub is ... One of the subs, is moored. You'll off load onto the submarine. There is kind of an almost vertical short ladder that goes down, so you need to be able to negotiate that. Also, if you have children, which I would highly recommend that you take children, there is no restriction in terms of age, but oddly enough there is a restriction in terms of height. You need to be three feet 36 inches tall, so if you make it over 36 inches, you can get on. Anyway, you'll be ushered into the submarine and then down below, you've got a series of really wide, maybe a couple of feet across in diameter, port holes. You'll have a seat kind of right there. You can look out this one, you can look out the one just to your left, just to the one to the right. Actually, you can turn around. You can see port holes behind you. People are kind of, one side is looking out, is seated and looking in one direction. Another grouping of people is in a line just on your back. They're looking in the other direction. You can easily look around and see what's happening all around you. You have a really good glimpse of what it's like to be in the underwater world. Once you're in, they're going to start the descent and they will completely submerge and go down to a depth of about 100 feet or so. There are some special reefs that are down there. There's normal reefs, but there's also artificial reefs that have been created using shipwrecks and even airplane wrecks, to create these reefs that are tremendous homes, great homes for coral formations to grow upon and for fish to show up and turtles and that sort of thing to hang out. You go down to the bottom and you have the opportunity to see what's down there. As you lose the light, as the light filters down as you're getting deeper, one of the curiosities is that you'll notice that whatever the clothes you're wearing, whatever colors they are, they will mute and adjust and change and you may be looking at your shirt and going, "I didn't wear that color." That's just the way things are with the light and refraction and the lack of light that happens at that distance, but you can see out really, really well, and really get a chance to observe the underwater world at that point. One of the questions that often comes up with regards to the submarines is people get claustrophobic, and they just wonder if they're going to be able to maintain themselves in there. You'll be down for 45 minutes. It is usually not a problem. People who are truly claustrophobic generally won't even get on the boat at all, they won't even think about it. If you just kind of have a curiosity about it, and you're not sure, there's a tremendous amount of rushing air, fresh air going through and that's really, really, helpful. They're also spacious, and you don't feel that claustrophobic kind of feeling. Also the fact that there's these port holes and you can look out, really helps. You're not enclosed in an area that you can't see outside. That shouldn't be a problem. One of the other things that people wonder about is like, "Well gee, what if the boat loses power? Can it get back up you know?" Well the way these are designed, is that they float. This is the natural way that they are on the surface of the ocean. In order to get down, the engines push them down, so if you were to lose power, which I don't know that its ever happened, the boat would just actually come up. So that's taken care of. You don't have to worry about that one either. This is the way that you can really get down to a depth of 100 feet. This is usually the depth of a first time, when a certified diver does a two tank dive, his first dive might be as deep as 100 feet, so you're going that deep, the same as a diver and you're down there for 45 minutes, so you're actually maybe down there longer than they would. It is a really interesting way for a kind of a novice or a person who doesn't dive and is not really familiar with that world to see what it's like to be under the water. Now, there's actually two vessels that they have, one is a more premium vessel and it costs moderately more to go on it, although both of these are going to be fine, but one does have these percentage of 27% bigger windows, so you've got more of that. It's a larger, instead of a 65 foot boat, it's a 100 foot, so it's much bigger on the inside, but then again instead of 48 passengers, there's 64. It is more spacious overall, so if you wanted to have that, you want to sign up for the premium. They're both going to be going down to the same place. Don't feel like you're going to be really missing out on something taking either one of the vessels. Also, there's translation. They will present the little discussion of what you're seeing underwater. It can happen in various boats at various times, certainly in English, and Japanese, and Korean, and Mandarin, and Spanish, and Korean. Depending on your nationality, you're probably going to have a nice translation. In any event, that is one of the amazing things about Oahu, is to have this incredible submarine just right at your fingertips to enjoy. It's only a ... The entire thing is going to take no more than two hours, so you've go the rest of your day to enjoy. You can do it in the morning and through the afternoon, they're going out continuously, so you can arrange your day very, very easily. Submarines on Oahu. Very cool. If you have any questions about Tours or Activities in Hawaii, just give us a call, or check out Tombarefoot.com We're here to help. Looking for a submarine in Hawaii? 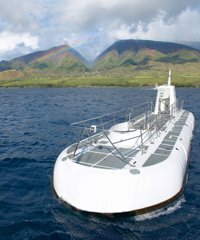 The islands of Oahu, Maui and the Big Island all have Hawaii submarine tours, and with good reason. Hawaii is blessed with an abundance of reef and sea life and seeing it on a submarine is, for most people, the only way they will be able to get deep enough to appreciate this part of Hawaii. When was the last time you were on a submarine? Never? 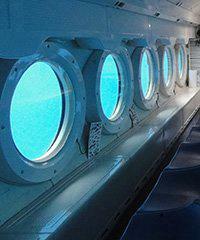 If you're one of the few who have been on a submarine, I'll bet it didn't have windows! Here's your chance to board a $4. Atlantis Submarine cruises will take you on a submarine cruise on one of their 5 million dollar underwater viewing vessels to depths of over 100 feet and stay submerged for approximately 40 minutes! This is not your typical glass bottom boat ride, as this Atlantis submarine boat actually submerges to the ocean floor.